Good morning! Happy Monday! I have a question for you! What’s the first thing you’re going to do when you get into to work this morning? If you’re like many, I bet the answer is, “Check my email!” For many of us, arriving at work and logging into the computer to send and answer emails is such a common way to start our day that we don’t think about it anymore. We just do it. What I wonder though, is how much joy does it give you? How excited do you get thinking about facing the email inventory that built up over the weekend…or…to searching your inbox for that one email a client said they sent but you just can’t find? Chances are, if you answer truthfully, what you’re really feeling is probably something closer to…dread. Honestly, I think that’s the way many of us feel. And not just because although, somehow, email was supposed to make us more efficient…it really doesn’t. (Think about all that waiting for answers, and then the other questions that arrive…or the time wasted scrolling down seventeen emails in one strand searching for the one piece of information that YOU need.) But, because, in the end, email doesn’t create the kind of real, personal connection that we, as human beings, want. Reading an email is just not the same as talking to someone on the phone…or even better…spending time with someone face to face. And often, instead of creating a connection, email actually separates us. Think about the times that you’ve tried to figure out whether the underlying tone of an email is one that you should be worried about. So, this lovely Monday morning, I have a challenge for you! Take a look at your email, and then, instead of responding with an email of your own, either pick up the phone or go and talk to the person who sent you the message. And, if you have a question or need help, instead of sending an email, give them a call! 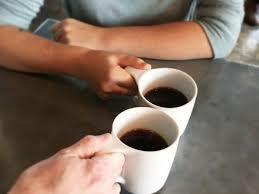 You never know, you might even be able to meet and have coffee while getting your question answered. Works great to improve team work and employee engagement, and…if it’s a customer you’re responding to…even better! You’ll be able to ask them directly how your service is and skip the survey…all while creating the personal, human connection that each of us craves. The personal, human connection that gives us the joy that we’re looking for in whatever work we do!